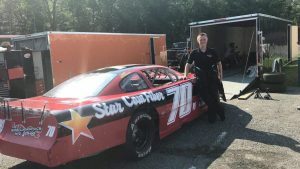 18-year old West Greenwich, RI native Jason Larivee Jr., is heading into the biggest late model race of his career this Saturday evening as he makes his American-Canadian Tour debut in the Oxford 150 from Oxford Plains Speedway located in Oxford, ME. 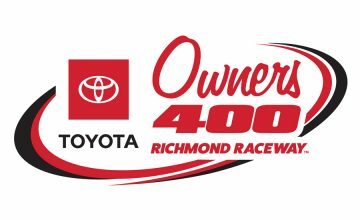 Larivee has an affordable program for fans to sponsor him heading into this weekend’s race as he will be on track in the StarCom Racing/Rolling Greens Golf Course No.70RI. For a minimum of $15.00, you can get a hand-written name on the deck-lid of his race car for the event. Larivee will be accepting payment through PayPal at JasonDCR70@gmail.com. Once payment has been made, e-mail him at the above e-mail address or direct message him on Facebook and tell him what you want your name to display as on his race car. All funds will go to his expenses for the weekend which will include fuel, tires, and travel expenses. I recently had the opportunity to ask Larivee some questions about racing, and the work he does for StarCom Racing. Check out what he had to say below. Sarah Handy: You have an awesome opportunity for fans to get their name on the deck lid of the No. 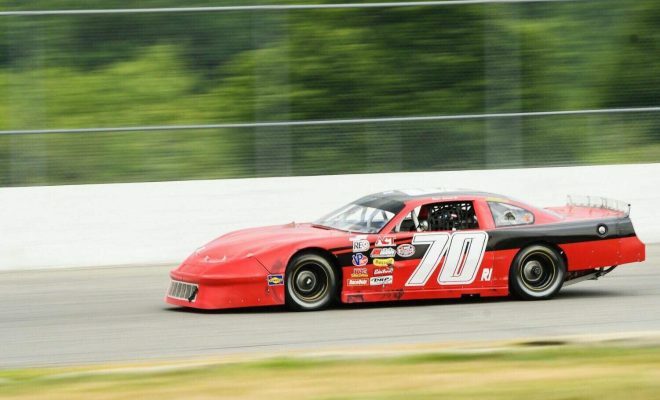 70RI when it takes on the American-Canadian Tour 150 at Oxford Plains Speedway this weekend. Tell me how the fans go about this and how this idea came about? Jason Larivee: It’s an exciting opportunity for myself and fans alike. My sister and I were trying to find a way for fans to get involved in an affordable manner, and it came to mind. SH: You’re making your American-Canadian Tour debut this weekend. You must be pretty excited about that? JL: Yes, we are going to make our first ACT Tour attempt. 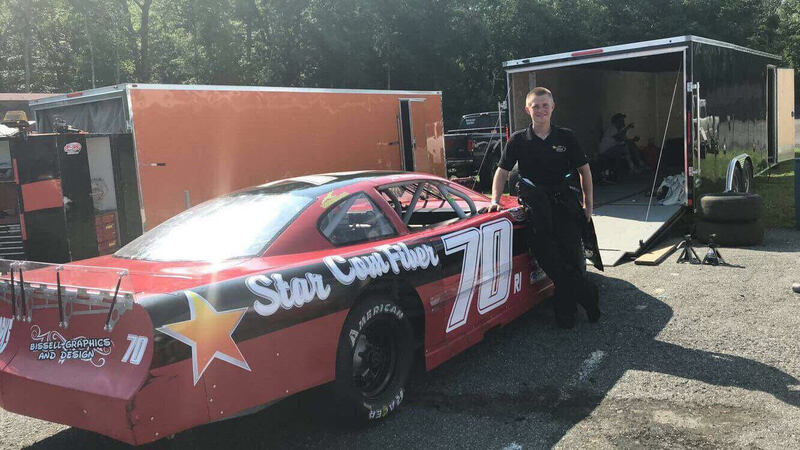 Obviously, this isn’t my first season in late models and we have been running the local races at Waterford Speed bowl and Thompson Speedway, which has gone well. Iâ€™m excited to really get a gauge as to where I need to improve my driving and team in the 150 lappers. SH: How did you get your start in racing? JL: I got my start in racing when I was 7 years old. I had been casually riding dirt bikes prior and decided to try racing. I was fortunate to have parents who supported me that early. SH: Being from Rhode Island myself we aren’t really that known for racing. Were you always a fan? Was it something you always knew you wanted to do? JL: Being from Rhode Island, I am certainly a bit out of touch of the NASCAR community, but its always been a passion of mine. SH: What’s your favorite race track you’ve been too whether it’s one you’ve raced at or you have attended as a fan? JL: My favorite racetrack to go to was definitely Bristol. I went there to help Derrike Cope in 2015. Behind the wheel, I definitely enjoy Thompson Speedway the most. SH: What’s been the most difficult obstacle you’ve overcome in your racing career to this point? JL: I think the biggest obstacle I’ve overcome is a broken femur while racing dirt bikes. I hadn’t lost a race all season, and I broke my leg with I think 4 races to go. The recovery took a long time. I was off the bike for a while and ended up winning the championship two years later. SH: Who’s your favorite race car driver and why? JL: Growing up my favorite driver was always Jeff Gordon. I’m not really sure why, but even today he is someone I really look up to. SH: If you could race against any driver past or present who would it be and why? JL: If I could race against anyone it would have to be Bobby Labonte. I feel like he was one of those guys that could run you hard all day long but never get into you. SH: What’s your ultimate goal as far as your racing career goes? Where do you hope to see yourself in the future? JL: My ultimate goal is to make a start in the Cup series at some point. I’ve gotten this far, so there are really no limits in my opinion. SH: What’s the best advice you’ve ever been given when it comes to racing? JL: My best advice I’ve ever been given isn’t by Derrike Cope. He told me something his father told him. “You’ll never be the best race car driver with the best equipment, but you need to be the most well rounded one.” That is something I held tight and try to do now. Obviously, you are an athlete, but you also need to be a marketer and a mechanic. SH: How did your relationship with StarCom Fiber and StarCom racing come about? 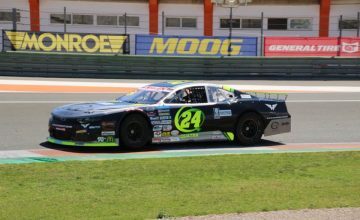 JL: My relationship with StarCom Fiber and StarCom Racing started last season, when they approached me about potentially sponsoring Derrike for a Cup Series event. I have handled all of Derrike Cope’s social media since 2015. From there I presented them information and they obviously have blossomed into a competitive team. Everyone from StarCom have presented me so many opportunities end I couldn’t be more thankful. SH: What’s it been like doing PR and Marketing for StarCom Racing in a sport as widely known and popular as NASCAR? JL: It is pretty cool to play a role in a sport with such reach. I am extremely thankful to be able to work with everyone from StarCom. I want to thank Jason Larivee for approaching me, a fellow Rhode Islander about this interview. Everyone at Rubbings Racing wishes him the best of luck this weekend. If you would like to follow Jason or StarCom Racing their social media links will be provided below.